...passed through this station in 1969, after which the lines were torn up and the railways converted to a public footpath, the "Flitch way" - running from just short of Bishops Stortford in Herts through to Braintree in Essex. 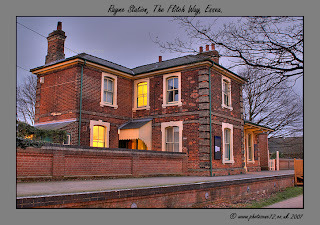 This old station at Rayne is now a visitors centre telling people about the footpath and providing information for those passing by. By the time we arrived there - we chanced upon it by accident really - the light was fading fast and so I decided to take three bracketed RAW shots and combine them into a High Dynamic Range or HDR image. What you see above is the result. Taken with the new Sigma 24-70mm. Home sweet home.....well, it will be for a week again anyway! This is Bayview Cattage, three miles outside Stornoway which is the only town of any size in the Hebrides. The cottage is lovely - although small, it's still plenty big enough for the two of us for a week, and the Rayburn stove - once you get to grips with it - produces bucket loads of warmth which is an important factor in the Hebs in April! Oh, the view out over the bay isn't bad either....! Well my new lens arrived today. Very impressed with CameraWorld in the end - I'd certainly recommend anyone to try them as their prices are fairly competitive and they really know their stuff! 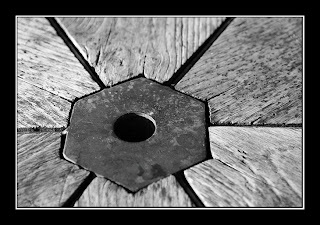 The shot above was taken at lunchtime - it's the centre of a table at the country park when I often eat my lunch and the graphic lines and grain of the wood really appealed. It seemed like the ideal shot to try out the nice large max aperture (f2.8) on the lens and also its close-focusing abilities! Camera in AV mode, Aperture at f2.8. ISO200. converted to mono in photoshop. One from yesterday evening after we got back from Maldon. 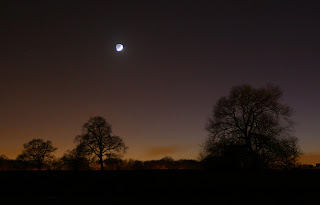 Taken from the hill on the Common along from Mum & Dad's - I intended to take some shots of the moons but it was way too cold to be able to stay up there for long and I took this one first. This was the first time I've used the tripod for anything more than setting up to try it out, and I must say that I'm impressed. It'll take a bit of getting used to to get the fine tuning right I think. 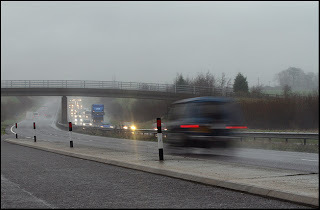 Tomorrow's shot should with luck be one with the new lens - fingers crossed CityLink turn up before lunchtime! This is my favourite shot from a short time this afternoon in Maldon. Each time we end up there I wonder why I don't go more often - the light tends to be fantastic and there's so much to look at. 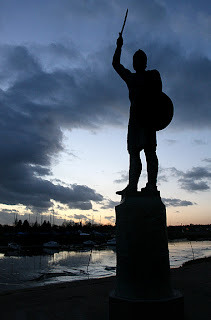 This statue is at the end of the spit that runs out from the end of the promenade. By the time we got out there everyone else had gone and it was lovely and peaceful, with a great flock of birds performing acrobatics for us! A little late this week....but here goes. This is Ben with a shell he picked up on the beach at Eriskay. The beach is known as "Princes beach" as it is the landing place of The Young pretender when he arrived in 1745. Ben had picked up the shell as it caught his eye and I told him to hold it so I could have a look, with the camera! I love the detail in the shot - both in the shell itself and in his fingers. Well this was my view for much of yesterday. Two site visits which had to be done necessitated a round trip from the depot at West Horndon, to Staines, on to Lewes in West Sussex, and then back to the depot. The weather was not what you could class as delightful - I took the camera feeling determined that I'd stop for lunch somewhere scenic and get something nice to post here - however a combination of the weather making the roads terrible and a delay on the first site put paid to that plan. This shot was a hasty grab at 4pm, whilst stopped to eat my sandwich. At least it gives me the chance once again to sing the praises of the Canon 70-200mm f2.8. The shot was at 1/8, ISO200 (deliberately held up there to force the shutter speed down) f11 and to say I was impressed at the performance of the IS would be understating things rather! As the weather is planned to stay much the same for the rest of the week it's unlikely I'll be posting a shot tomorrow, however hopefully on Saturday there will be a new addition to the camera bag in the form of the Sigma 24-70mm f2.8 so no doubt I'll be wanting to play with that on Sunday! Once a week between now and easter when we go away, I plan to post one of my favourite shots from our holiday last year. This shot was taken midway through our second week. It was the first day we saw a full day of sunshine - prior to this is had been the odd few hours of sun in between howling winds and rain! 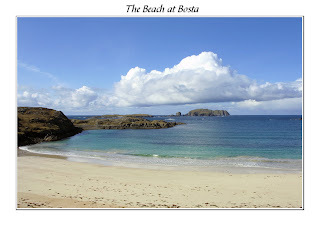 We went to this beach at Bosta, on the Island of Great Bernera, as there is a rebuilt iron age house there. Unfortunately when we got there the house was locked and we couldn't get inside. All was not lost though as there was at least this fabulous beach - which is now firmly on our list of places to go back to this year! ....On our road to changing the way we eat. 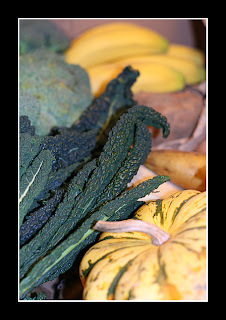 This is our Organic veg box. First one has arrived today and it all looks really tasty! We weren't fussed about it being organic to be honest, but the key thing for us was that so far as possible, the contents will be locally grown (From across East Anglia mainly) and really fresh. I find it ridiculous that when I go into the supermarket I struggle to get mushrooms that are grown in the UK, and yet just five miles up the road from us there are mushroom farms churning them out by the tonne! Where do they go? Well, ludicrous as it seems, abroad! Whilst Tescos are busy selling us Dutch or Belgian mushrooms (Only their organic ones are grown over here) farmers locally are busy shipping theirs hundreds of miles. 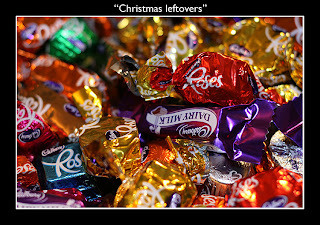 This is the remains of the big tin of Roses Ben's brother bought us for christmas, and jolly nice they are too! That's the one problem with Christmas though - you come into the new year vowing to eat healthily, but before you can you have to finish off the christmas goodies! The shot was taken using the nifty fifty on the 30D, lit via an anglepoise lamp from above and just a touch of flash to fill out the shadows. First time I've used the flash exposure compensation on the 550EX so that's another thing I'm learning! Here we go for day 2. Thanks to work meaning all my daylight hours are accounted for I'm getting precious little camera time at the moment - must start searching the flat for some indoor inspiration....! The shot above was taken at Blackpool Sands on the South Devon coast whilst we were staying with Ben's folks in Dartmouth over New year. Blackpool sands isn't one of our normal haunts - we're more inclined to head a little further along the coast to Slapton or Torcross, but the light was dropping sharply and we were both keen to get some shots whilst the waves were crashing. We're unlikely to get a spring visit down to Devon this year as the In-Laws are shortly off to India for 6 weeks! ....or maybe just a jump on the bandwagon. Either way I'm seeing more and more of these photo blogs around at the moment, and it was something I felt I should try. I make no promises about "A picture a day" but I WILL try to make it my inspiration to get the camera out at times when I otherwise might not. Please if you see something you like, do leave me a comment, or ask a question. Check out my links list for other sites and forums I visit. 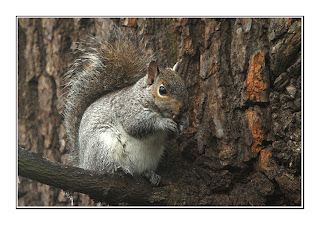 For a first picture - have a squirrel! 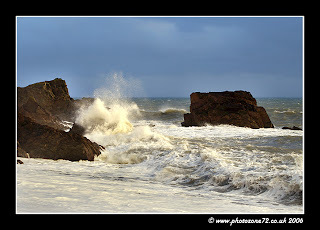 This was taken just down the road from here, on the first day I was using my long awaited 70-200f2.8 IS on the 30D.